The Mitchell Ayres Orchestra was a cooperative effort founded by a group of musicians who left the Little Jack Little Orchestra in the mid-1930s. Violinist Ayres served as front man for the band, an atypical collection of performers which at first glance appeared more like a group of homely scientists than an orchestra. Nevertheless, the band, whose catch phrase was “Fashions in Music,” proved itself one of the more musical hotel ballroom orchestras. It never truly swung hard but did present some good arrangements, specializing in novelty numbers and swing versions of the classics. It’s most memorable hit was “On Treasure Island.” Featured singers were Abner Silver, Ruth Gaylor, Maryann Mercer, Tommy Taylor, Johnny Bond, Tess Gardella, and Meredith Blake. The orchestra appeared in three movies in the early 1940s before disbanding. They recorded for the Variety label in 1937 and Bluebird from 1939 to 1942. 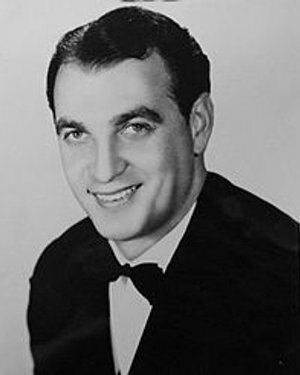 In the mid-1940s, Ayres became the musical director for Columbia Records. He also orchestrated several television programs, including that of Perry Como, for whom he worked throughout the 1950s, and on TV’s Top Tunes and The Hollywood Palace. Mitchell Ayres passed away in 1969 when he was struck by an automobile while crossing the street.